I've only got a few images to share of Artarmon in the '70's. Their depot was at the rear of a service station on the Pacific Highway at Gore Hill and then moved to Whiting St, Artarmon. Operated Routes 52 (Chatswood to Artarmon) and 192 (Artarmon to St Leonards and Crows Nest). Another Sydney operator now passed into history. Enjoy. mo731 at Artarmon was this Albion Aberdonian with Coachmaster body of November 1958. Vehicle came to Artarmon from Saints at Peakhurst where it also carried the 731 rego. Bedford SB5 conversion with CCMC body of 1965 was mo4257. Purchased by Artarmon from Glenorie where it was 798.
mo282 was this Ford D400 with MBS body of 1972. Previously 5222 with Bowden at Waverley. Another shot of 731, this time in the depot, with a Freighter Lawton bodied AEC Reliance mo5575 peaking out from just behind it. Sorry, but that's it from me for Artarmon. Operated from the Western side of Chatswood Station, in Victoria Ave. Adjacent to the RSL Club. Remember seeing this interesting collection of buses while waiting for the Hornsby Bus Co. route 55. Thanks. For me you have captured the essence of Artarmon BS with the pics of 731. I think their other Aberdonian was 739? Leon Manny talks about this operation in his book, "Terminus, please", by saying the David Denholm, the proprietor, drove these buses as a fill-in job, but lasted there many years. I have a nice shot of 739 departing Chatswood - if I could get someone to post it. (I can't seem to get Photoshack to work) The Aberdonians were little classics - had a very sweet sounding motor and gearbox whine. Its a pity noone was around to preserve one in those days.I understand they are on a property as sheds in the Marulan- Goulburn district. All this other information previously supplied by and with many thanks from the previous members: GM; Dave Wilson; Robert; Crimsontide; Centralian etc. and anyone else previous whom may of not of been mentioned. Working on the Morning/Day-shift was - Reg. Reg was an amazing kind hearted wonderful Gentleman - that was so very courteous and a smooth careful driver. I always remember Reg by wearing his white shirts and the shiny silver Armlets to keep Reg's sleeves tidy and rolled up. There was - Harry - working the Afternoon/Night-shift. a very swift driver that did not muck about in getting you to your destination. I always remember wanting to know him more and would have loved to have chatted and got to know him - but he was a great but stern, no time for chat - straight down to driving - Man! Then of course you could not forget: Big Dave. Dave was also a great man, I always remembered him as the rotund chap there to keep things going, always there as the boss and as the back up man. He was friendly, occasionally sweating when he was under pressure to always happily get things done, he also was jovial and had a kind heart. I always remember when I was a young lad of about age 8 and travelled on Reg's Bus - Reg would let me (when the bus was stationary) - inside his Albion Aberdonian route 52 - he would let me Close the Doors with the lever, and then let me Push and extend out the Manual right turn Hand lever - to show the actual hand turned out and down to show we were pulling out from the bus stop. - My goodness! I was so thrilled to do it. Reg was such a kind hearted man - whilst he was Laid-up at the Bus stop on the north part of Chatswood Railway station next to 446 Victoria Ave outside the RSL Club. On one Saturday morning whilst Reg was waiting for his next run from Chatswood to Colwell crescent, Reg took both my sister and myself across t he other side of the road to one of the old department store - Waltons. And there he bought us a back of lollies and other treats. Waltons no longer exists it used to be where the office block for Tower 1 and Tower 2 is at 473-495 Victoria avenue. I also do not think the kind heart of such people would happen in this day & age, as it would be misconstrued as the driver being a bit dodgy. But No not back then - All was great then and I really really miss those wonderful days in the Late 1970's. Thank you all for remembering the Artarmon Bus Service. Here is the other members I mentioned above that contributed with all the information below and statistics for prior to the Artarmon Bus Service operation, and the aftermath of its journey. And a big thank you to: Centralian - for his wonderful pictures. 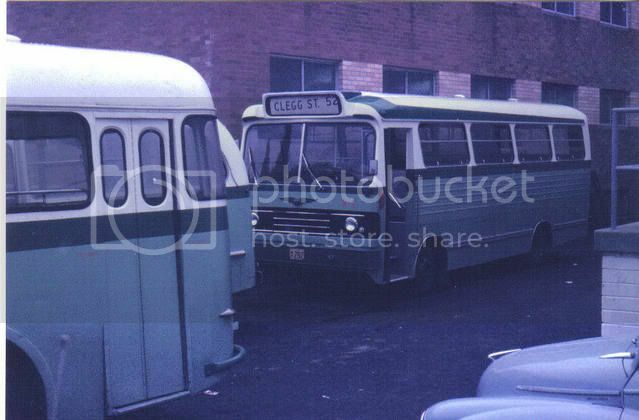 David Denholm (Dave), the proprietor, drove these buses as a fill-in job, but lasted there many years. Mr and Mrs Threlfall did own and operate Artarmon Red Bus Service. Bill Threlfall passed away in December 1960 or 1961, subsequetly Mrs Threlfall remarried to Mr Murray Bouchier. Mrs Bouchier (nee Threlfall) then passed away, Murray then expanded the bus business with the purchase of Mosman Bus Service, which was then run by Murray's son, Peter. This was the operation that ceased on 30/06/1965 - both Mosman and Artarmon. 192 (Artarmon to St Leonards and Crows Nest). This is Another Sydney operator now passed into history. I Remember seeing this interesting collection of buses while waiting for the Hornsby Bus Co. route 55. David Denholme was known as the biggest little operator in Sydney. • These routes together with the Lane Cove Bus Service routes (see under Deanes Coaches) were taken over by Macquarie Towns Coaches in 1985 retaining the trading name Lane Cove Bus Service. Macquarie Towns (Lane Cove) was taken over by Harbour City Coaches by September 1987 and on 14/8/89 became part of the North & Western route network. However routes 52 and 192 were not involved in that take over. • From 12/7/90 the STA(State Transit Authority / Sydney Buses) operated a route 260 as a peak hour service generally covering route 52 but this appears to have ceased by the end of 1993. Routes 52 and 192 ceased to exist as from then. And subsequently to my writing that the STA took over Norther & Western. Artarmon Bus Service (2) Albion Aberdonian/Coachmaster ex Saints Peakhurst. They also had a similar unit m/o 731 also ex Saints. They both went to Hills Bus Sales with both lots of plates resurfacing at Hills’ Highway Tours. Artarmon's depot was at 9 Whiting Street. Artarmon & Lane Cove Bus Service were purchased by Macquarie Towns Coach Lines on 30 July 1985 from David Denholme & Bernie Best with 7 & 10 buses respectively. The Lane Cove depot was closed with a yard leased around the corner from Whiting Street at 115 Reserve Road. The Artarmon buses were replaced fairly quickly with buses from MTCL's Windsor operation with at least one Artarmon bus, a Ford D400 / MBS, seeing further service at Windsor. Sept 1987 route 52 and 127 combined full time and renumbered as route 264 Chatswood - Collwell Cres - Longueville and Chatswood – Artarmon – Willoughby- Naremburn – Crows Nest trips renumbered 192 [1925 number] probably at same time. 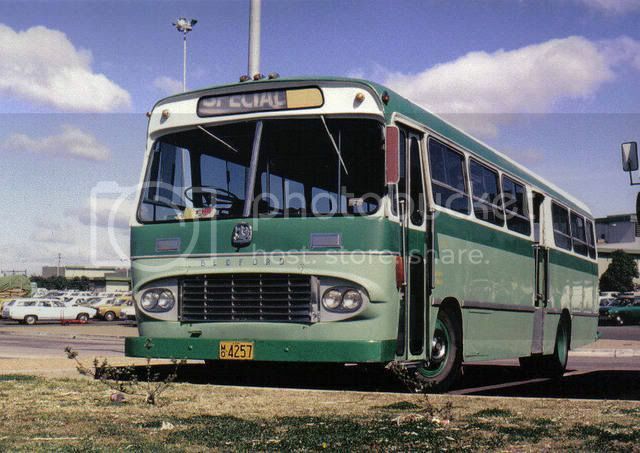 Previous correspondence was that quite awhile ago - when owned by the Threlfalls, Artarmon Bus Service had their vehicles reposessed by Associated Securities Limited (a finance firm - ASL) and Col Sinclair took over the route as a temporary solution. 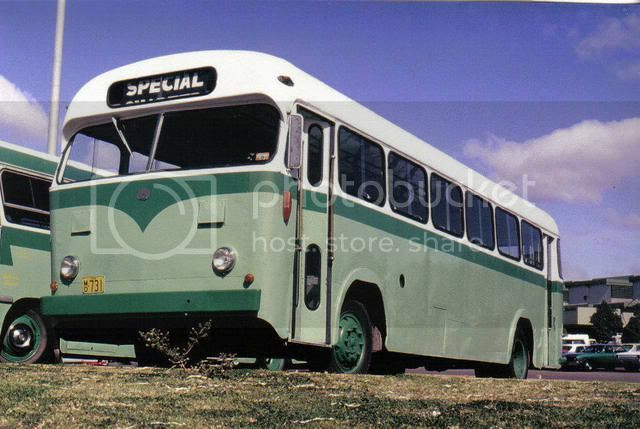 Deanes Coaches (then Turramurra Bobbin Head Bus Co) bought a few buses off the finance firm (ASL). Bernie Best later took over, who had the run until MTCL bought him out. Previous correspondence was that they remembered Maurie Griffin telling them that David Denholme, when running special, often used to head off to the Hornsby Bus Group highway bus to gain a little extra revenue! The first two photos above of m/o 739 and m/o 5573 are Leon Batman photos and are already in the photo gallery. On that basis it is assumed that the other photos may also not have been taken by thd poster, in which case acknowlegment of the photographer should be given. I cant here have alook to see what the various .jpg's are which are also spread throughout the post. I may do that later on my full computer. Reactivated the original Centralian photos which were defined in a format which is no longer supported by the current board. As a result it has been found that all the rest of the photos in this new post except m/o 5575 were in fact in the original Centralian post. Removed the various bits in this new post to non existent jpg's etc. Artarmon Bus Service didn't actually own the depot at Whiting Street. The land was owned by the RTA for possible use with the then proposed Gore Hill Freeway. It was leased for an initial 5 years with options to renew. Prior to the buses being garaged at the rear of the service station up on the Pacific Highway they were kept at a site a very short distance north of the Whiting Street depot. 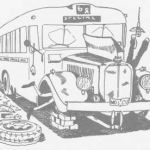 Thank you so much for posting the history of Artarmon Bus Service, it brought back so many fond memories. I do remember big Dave, he wore black frame glasses. In this article you mention the Artarmon Red Bus Service. I remember catching a yellow bus that travelled between Artarmon public school and dropped off passengers outside the fruit shop on the eastern side of the Artarmon station. It then continued to drop off all over the eastern side. It also picked up workers returning from the city at about 6.00pm daily. My question is, is this the same bus company (Artarmon Red Bus Service), and does anyone else remember this service ? Dave Wilson wrote: I have a nice shot of 739 departing Chatswood - if I could get someone to post it. (I can't seem to get Photoshack to work) The Aberdonians were little classics - had a very sweet sounding motor and gearbox whine. Its a pity noone was around to preserve one in those days.I understand they are on a property as sheds in the Marulan- Goulburn district. 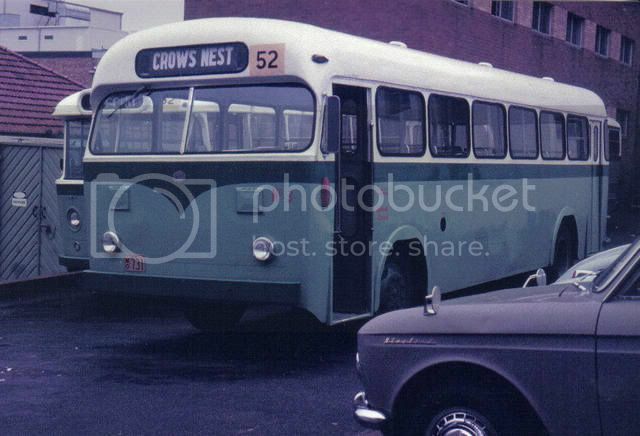 Hello Dave, This is a long shot, but I was wondering if you still had this picture of 739 departing Chatswood. I'm doing a history page on facebook of Chatswood and I would love to include it. I have a shot of MO 4665 leaving Chatswood, It's not the same shot is it?